Once again, we've attacked one of the terraces of the veg garden, taking lots of 'old' dirt out and adding fresh compost. We also needed to add 'root blockers' at the bottom of the terrace basket, as the surrounding redwoods come in to steal water and soil nutrients through the bottom. So again, we're using that hardboard stuff that was part of the concrete forms to create a bit of a barrier to keep the roots out. and I thought gophers were going to be the problem! The roots are so bad in some spots, it's hard to put the shovel through them. Melissa did most of the digging, and it's sticky wet stuff these days. Here she's standing on the bottom of the terrace, with a few hardboard blockers in place, and now the process is to move all that dirt in front of her behind her, and put blockers down as you go. does a good job of aerating the soil, that's for sure. For lunch yesterday, Melissa made a ramen soup with miso and all the veggies were from our garden. Love it! Since once again we need to pull out old soil from our veg garden to be able to add fresh compost (with the terraces we have, we only have so much volume we can handle) we thought we'd try and set up a new shade garden for the summer. We finally found a use for those old 'hardboard' pieces of junk used to make the concrete forms back when we were making the bond beam of the foundation. They're now 'root blockers', keeping the redwoods from coming up through the bottom to get at the nice soil and water. we threw down some logs and added the dirt excess from the garden (actually, we'll have a ton more to take out yet) I'll post pics of lettuce sometime soon, I hope! Melissa goes up and 'thumbs' every layer after it goes on, making sure it gets tied into the previous one. Here she is in the main bedroom, working on the interior wall that separates the living room from that bedroom... you can see the chimney pipe in front of her. Almost there! Note we've started making the main bedroom into the carpentry shop, as the walls are done in there, and we don't need to cob in that area anymore, so it's an easy place to work in the shade, or out of the rain, and we don't have to move stuff around. Here you can see the outside of the wall above the southern windows... so far. It's just a patchwork of plywood, which will be what we attached lathe to before plastering. It's a wooden wall section that will look as though it's cob when it's done. Notice that we're using all the scraps around the place for this work. No point in worrying about whether the plywood is clean or not, since we're going to slather it with mud later on. here you can see the wall above the window from the inside. We'll put insulation in that as well, and it will get covered with plywood, then metal lathe, then earthen plaster. Then, probably a book shelf. As readers know, we have an earthen subfloor that we've been working on top of for a year now. On top of this will go the radiant tube layer, which will be 1.5 inches thick with the tubes running all through it. On top of that will be a .5 inch finish layer. Thus, we have 2 more inches of floor to go, and we have three levels to work with. So, we need steps between them. We probably could just create clay floor steps, but the potential for damaging the edges and the lack of visual distinction between levels didn't appeal to us, so we started thinking about a wooden sort of 'retaining wall' for the edges of each level. Here you can see the different pieces that have been roughly planed and lap jointed to go around the curve of the upper level step. They will be planed a bit more, and the probably sanded quite a bit, and then glued and screwed together. Finally, to hold them in place, we'll probably do some glue between wood and cement, but also have nails sticking horizontally into the clay floor behind it, like anchors. A little side project has been to glue up the main bedroom door, which will be a pocket door, on wheels. It's now all glued together (about 38" wide - will be trimmed down) but I needed to do some more planing of the center of the board. The only way I could comfortably get at the center was to get up on the table itself. Sort of a weird technique, but I knew the workpiece wasn't going to move away. Here's the photo of the last cob going onto the north wall - up in the NW corner of the toilet area - it's actually going right where the sun is hitting the wall. And here's Melissa 'thumbing' in the latest layer over the 2nd bedroom door. You can see (two) bottles buried in that are the first of 5 that will be sort of a glass block design in this area. Obviously they need some trimming out. 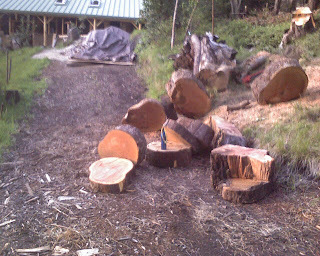 I finally got around to cutting up the last of that giant killer madrone that hung over the driveway. After the initial cutting up of most of the tree, it was out of the way, so I left it for a while. Still, I knew I had to get it done before the bugs came, or it'd be useless. It was so thick though, I had to use my big chainsaw, which I felt wasn't working great lately. I found that the saw worked great however, and was able to cut some thin disks that we'll use as stepping 'stones' in different pathways. 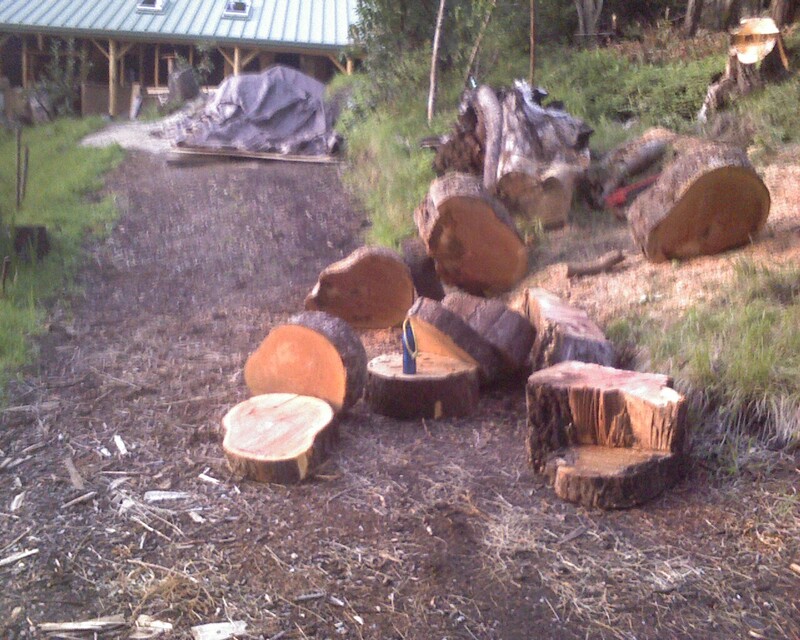 You can see how big these chunks are by noticing my blue water jug sitting in the middle of the pile. that's a standard size jug, i.e., 750ml/wine bottle size.